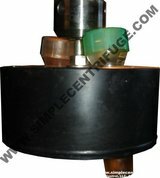 Photos in this section show the development of the simple centrifuge over a period of two years. This is our first centrifuge attempt, the "Lab Centrifuge" from July 2005. We have a page devoted to this here. 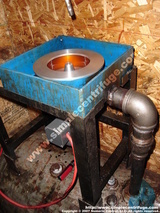 This is our first bowl centrifuge from August 2005. Pipe fittings on the drill press but it proved it would work. This rotor only processed about 2 gallons of our nastiest oil. We knew we had a winner idea. This is our first machine from October 2005. The housing was too small, lacked seals, and the splash wall but it worked! Those items would come later. This is a rare photo from the first machine. Look at the water droplets it collected. It worked well. If any picture shows what the centrifuge can do this is it. This picture shows what the oil looked like going in. It was amazing. Soon after we built a new housing from steel plate. This has proven to be a very durable and flexible housing. 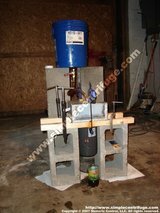 In May 2006 we water tested our belt drive version of the centrifuge. It was based on a table saw arbor. At 6900 RPM this machine does over 5000g. We used this for 6 months. In October 2006 we switch back to the direct drive with our new rotor design. In January of 2007 we introduced the self draining bowl. This has been a huge time saver. This is a photo of our new three hole design. In May 2007 we completed the patterns for our cast body, lid, and legs. With all plumbed inlets and Viton seals it should prove wonderful. No more leaking oil all over the garage.